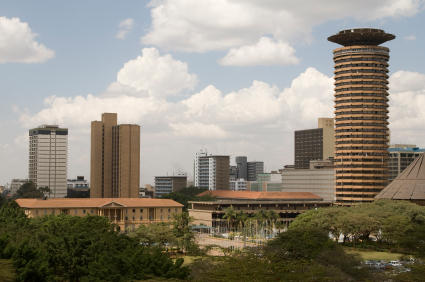 Nairobi is the capital and largest city in Kenya. The name "Nairobi" comes from the Maasai phrase Enkare Nyirobi, which translates to "the place of cool waters". However, it is popularly known as the "Green City in the Sun". Founded in 1899 as a simple rail depot on the railway linking Mombasa to Uganda, the town quickly grew to become the capital of British East Africa in 1907 and eventually the capital of a free Kenyan republic in 1963. With an estimated population of 4 million, Nairobi occupies 684 square kilometres and is currently the 13th largest city in Africa. Now one of the most prominent cities in Africa both politically and financially, Nairobi is an established hub for business and culture and is home to many companies and organizations, including the United Nations Environment Programme and the UN Office in Africa. A number of international events have been held in the city among them being the annual Nairobi Marathon, sponsored by Standard Chartered bank. This has become a signature sports event that brings together runners and supporters from all over the country as well as foreign participants to Nairobi, the beautiful capital city of Kenya and home of the greatest distance runners in the world. One of a kind in the world, Nairobi city is bordered by the Nairobi National park which contains many animals including lions and giraffes and is home to over 400 species of birds. The Nairobi safari walk is a major attraction to the park as it offers a rare on-foot experience of the animals. Nairobi is home to a lot of cuisines, the restaurants offer a selection of world class African, Mediterranean, European Oriental and cuisines. Nyama choma is an exciting eating experience and an integral part of Kenyan culture, best eaten outdoors. Being a cosmopolitan and multicultural city, Nairobi has activities to cater for all tastes. There are places of worship for numerous religions, museums, parks and picnic sites, bird sanctuaries, cinemas and theatres, art galleries, night clubs, live band concerts, sports facilities and numerous restaurants. Panari sky Centre houses Solar Ice Rink, the largest ice rink in Africa: The rink, opened in 2005, covers 15,000 square feet (1,400 m2) and can accommodate 200 people. Nairobi known as the ‘Green city in the sun’ has beautiful scenery for viewing, photography and filming. Though young, the local film industry in Kenya is growing and today, Kenya Film festival has become an annual event featuring films from local film makers. Popular movies such as Out of Africa and The Constant Gardener have been filmed in Kenya.